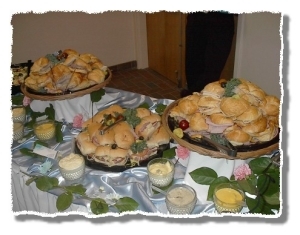 Andrew B. Barber & Clarence D. Oberwortmann Horticultural Center menus, Cutting Edge Catering, Catering to your every Whim! Serving Joilet and the entire Chicagoland area! Dedicated in 1998 and newly remodeled in 2004, the Andrew B. Barber & Clarence D.
Haven Greenhouse. Its limestone exterior with wooden-beamed entryway and easy access to a charming outdoor-covered deck with patio seating is conducive to the natural surroundings of the 630 acres of Pilcher Park. The Center attractively enhances the Bird Haven Greenhouse complex while providing additional space for a rental banquet hall. The Italian Renaissance style greenhouse, which is perfect for wedding ceremonies, features spectacular floral shows with seasonal motifs during the fall, winter, and spring. 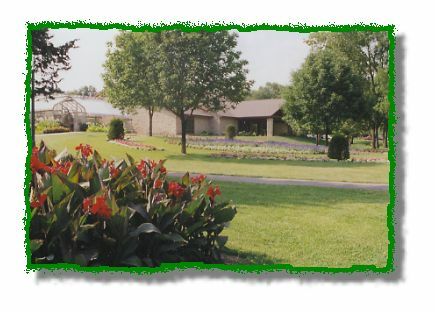 The Outdoor formal gardens are open June through October. The Bird Haven Greenhouse’s formal gardens are the perfect setting for an outdoor wedding or come inside for an intimate ceremony amongst the beautiful flowers and greenery. Dinner Package: Includes 4 Hour Hall Rental and the Menu. Classic Package: Includes 5 Hour Hall Rental, the Menu and a 4 ½ Hour Standard Open Bar. º All prices are subject to a Security Guard Fee, 15% Service Charge and applicable sales tax. º All prices and packages are subject to change without notice. º Bar Gratuities are required, 15% prepaid bar gratuity if tip jars on the bar are not allowed. the Ultimate Dream and the Elegant Enchantment Wedding Packages. º Minimum number of guests, bar minimums and packages required varies depending upon the date. Beefsteak Tomato Slices with Buffalo Mozzarella Cheese, Fresh Basil & Virgin Olive Oil on a Bed of Spring Salad Mix. Choice of Dressing: Italian, Ranch, French, Thousand Island, Raspberry Vinaigrette, Balsamic Vinaigrette or Low-Calorie Italian. Soup: Chicken Noodle, Chicken with Rice, Tomato Vegetable, Beef Vegetable, Beef Barley, French Onion, Cream of: Chicken or Broccoli. Have Soup & Salad....... Add $ 1.75 per person. Each Additional Vegetable Selection is $ 1.10 per person. Each Additional Accompaniment Selection is $ 1.25 per person. Gold Band China, Stainless Steel Flatware & Water Goblet. Lemon Laced Ice Water Carafes, Hot Thermal Coffee Service, Old World Bread & Butter. 72" Round Tables (seats 10 people), White Wood Padded Formal Garden Chairs & Complete Set Up. White Linen Tablecloths (80" x 80") & Choice of Colored Linen Napkin. Table Set with Salt, Pepper, Butter, Cream & Sugar. Balsamic Vinaigrette with Bourbon Caramelized Onion - Add 75¢ per person. Prices above are per person based. Fresh Cut Flowers and Greenery. Add a Uniformed Chef Carver for $ 150.00 (1 Chef per 100 guests). **Accompaniment Selection is not included. For Plate Style Dinners there is a Multiple Entree Choice Fee of $ 1.00 per person, if you choose up to 3 different entrees. The Banquet Package price includes the Beer & Wine Open Bar. The Classic Package price includes the Standard Open Bar. Includes: Absolut Vodka • Tangueray Gin • Captain Morgan Spiced Rum • Jack Daniels • Crown Royal • Chivas Regal Scotch • Hennessy Cognac • Cuervo Tequila • Smirnoff Vodka • Beefeater Gin • Jim Beam • Bacardi Light Rum • Korbel Brandy • Seagrams V.O. Whiskey • Dewars White Label Scotch • Champagne • Miller Lite • Bud Light • Sutter Home Wines: Merlot, Chardonnay, Pinot Grigio & White Zinfandel • Soft Drinks • Juices. 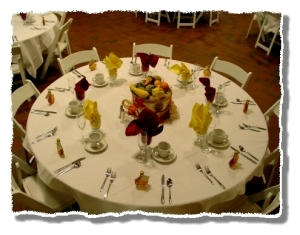 Banquet Package Add $ 4.75 per person or Classic Package Add $ 3.75 per person. Includes: Smirnoff Vodka • Beefeater Gin • Jim Beam • Bacardi Light Rum • Korbel Brandy • Seagrams V.O. Whiskey • Dewars White Label Scotch • Champagne • Gordon’s Vodka • Gordon’s Gin • Castillo Rum • Canadian Mist • Early Times • Dawson’s Scotch • Gold Tequila • Amaretto • Peach Schnapps • Southern Comfort • Miller Lite • Bud Light • Sutter Home Wines: Merlot, Chardonnay, Pinot Grigio & White Zinfandel • Soft Drinks • Juices. Banquet Package Add $ 3.75 per person or Classic Package Add $ 2.75 per person. Includes: Gordon’s Vodka • Gordon’s Gin • Castillo Rum • Canadian Mist • Early Times • Dawson’s Scotch • Gold Tequila • Amaretto • Peach Schnapps • Southern Comfort • Miller Lite • Bud Light • Sutter Home Wines: Merlot, Chardonnay, Pinot Grigio & White Zinfandel • Soft Drinks • Juices. Banquet Package Add $ 1.00 per person. Includes: Miller Lite • Bud Light • Sutter Home Wines: Merlot, Chardonnay, Pinot Grigio & White Zinfandel • Soft Drinks • Juices. The Beer & Wine Open Bar Prices are: 3 Hours is $ 12.00 per person, 4 Hours is $ 13.00 per person, 5 Hours is $ 15.00 per person. Includes the Wine or Champagne Glasses. Wine Choice: Chablis, White Zinfandel or Champagne. For Merlot, Cabernet Sauvignon, Chardonnay or Pinot Grigio add 25¢ per person. Includes the Wine or Champagne Glasses and 1 Bottle of Wine or Champagne. Kahlua Coffee Liqueur, Bailey’s Irish Cream, Hennessy Cognac, Dom B&B Liqueur and Drambuie Liqueur. Each Additional Hour is 75¢ per person. Instead of Disposable Glassware add Real Glasses! Bar Special Orders are available at an additional charge. Ask about Non-Alcoholic Open Bars, Cash Bar and Side Cash Bar Options. 15% prepaid bar gratuity if tip jars on the bar are not allowed. Includes bartender(s) when having a minimum of 75 people. Add Any of the Wedding Packages to the Classic Package Price. Let us tailor a Complete & Custom Package to suit your exact needs. Commemorative Brick for the Buy-A-Brick Program. Custom Packages are Available - Call for Your Custom Quote. The Allure Package Casual, Yet Charming! a Buffet Style Meal & White Linen Tablecloths for the Guest Tables. Our Touch of Class Service Package is designed for when you want an extra special event. Cutting Edge will provide uniformed buffet attendants along with an elegant buffet presentation including colored overlays, props, and beautifully accented with fresh cut flowers and greenery. Contemporary chafing dishes, wicker baskets, cut glass serving bowls, platters, and serving utensils are all included. Our courteous staff can be available to serve and replenish the buffet, along with clearing guest tables after the serve. Each Additional Side is $ 1.00 per person. Each Additional Entree is $ 1.75 per person. Add $ 10.50, plus the menu cost from the menu you selected in that brochure. *Plus the menu cost, from the menu you selected in that brochure. Showers ° Birthdays ° Business Meetings ° Seminars ° Reunions ° Etc. The Horticultural Center can be subdivided into 3 separate sections. Give Cutting Edge a call at (815) 725-9001 for Custom Packaging & Pricing. We are more then happy to try and work within your budget! The Italian Renaissance style greenhouse, which is perfect for wedding ceremonies, features spectacular floral shows with seasonal motifs during the fall, winter, and spring. The Outdoor formal gardens are open June through October. The Bird Haven Greenhouse’s formal gardens are the perfect setting for an outdoor wedding or come inside for an intimate ceremony amongst the beautiful flowers and greenery. • Reservation times are: 9:00 am, 10:30 am, 12 noon, 1:30 pm, 3:30 pm, and 5:00 pm. 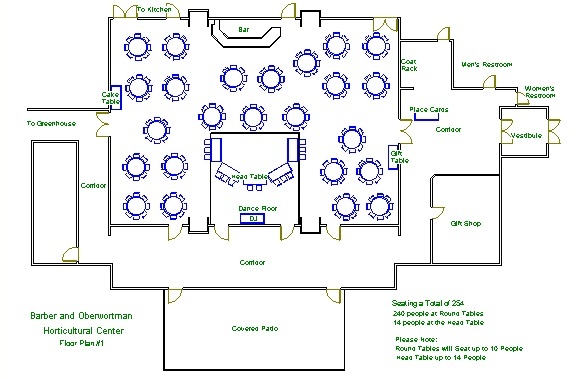 The 5:00 pm is only available with the rental of the hall for the reception. maximum chairs 125. A 24 hour notice is need for the number of chairs. • A $50.00 (fifty dollar) deposit is due at the time the wedding is booked. The wedding must be paid in full one week before the scheduled date. • All ceremonies must begin and end on time! 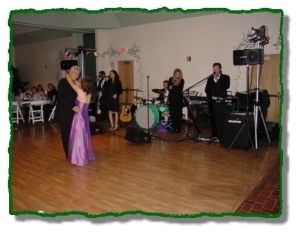 • All decorations, props, music, officiate, and rehearsals must be provided by the wedding party. • Wedding parties are to arrive dressed and no earlier than one (1) hour before their allotted time. • Flower girls must drop ‘fresh’ petals sparingly. Birdseed and bubbles may be used outside only. number of people recommended is 125. • Wedding will be moved into the greenhouse in weather that is unsuitable for outdoor weddings. The bride will have the final call. inside rehearsal arrive before 4:00 pm. Rehearsals scheduled after hours are on your own. • The greenhouse staff will not be responsible for any items left behind. (815) 741-7278, Ext. 5 for Kevin & Ext. 6 for Marcia. Custom Hors D’oeuvres Packages and Party Trays are also available. See our Corporate & Casual Menu Brochure for other options and more description. strawberries (seasonal) and mouth watering fresh cut fruit display with Strawberry dip. A dazzling array of Gourmet Sweet Bars including: Carmel Apple Grannies, Chocolate Raspberry Tangos, Lemon Berry Jazz Bars and Marble Cheese Truffles, plus our Royal Mini Cheese Cakes - Amaretto Almond, Raspberry, Silk Tuxedo, Cappuccino, Vanilla, Lemon & Chocolate Chip. Sweet Tables can be ordered in lesser quantities then the number of guests actually attending. Coffee Choice of: Regular or Decaffeinated. Includes: Cream, Sugar, Artificial Sweeteners and Black Plastic Cups. Coffee Choice of: French Vanilla, Regular or Decaffeinated. Includes: Flavored Creams, Shaved Chocolate, Cinnamon Sticks, Sugar, Brown Sugar, Cream, Artificial Sweeteners and Black Plastic Cups. Each additional Hour is $ 1.00 per person additional. Come to our Office to see our Wedding Cake Book or Check them out on the Web. Other Information: The Anniversary (Top Tier) Cake is served, unless requested not to do so. Cathy's Sweet Creations will make you an exact duplicate of your Anniversary Cake in a year. Just contact her. Required number of servings varies depending upon the style of cake or number of tiers chosen. Cake Knifes, Cake Toppers and Cake Flowers are not included. Sample Floor Plans - Custom Floor Plans Are Also Available. from I-80 and Route 30 on Gougar Road.